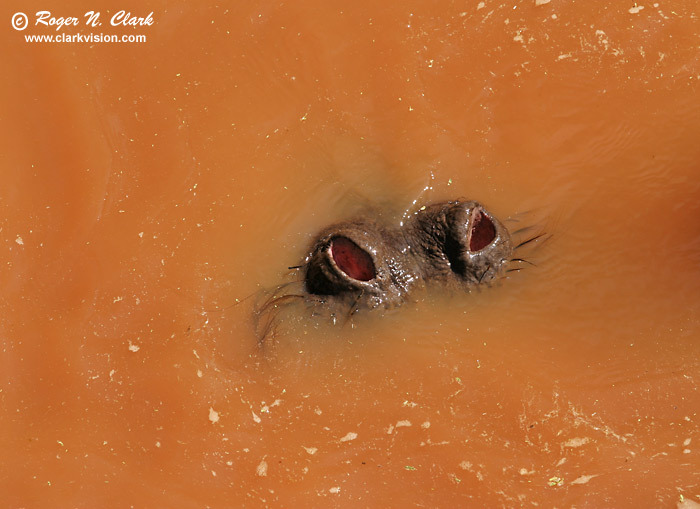 A hippopotamus in a small stream, showed just its nose. This stream was so small, while crossing a bridge we thought it was only a coupe of feet deep, yet there were several hippos in the murky water, and only their noses could be seen when they surfaced. Lake Manyara National Park, Tanzania, Africa. Technical: Canon 10D 6-megapixel camera, Canon 70-200 mm f/4 L IS lens at f/6.7. Exposure: 1/350 second at ISO 100. Slight crop.